During many years in Norwegian Top football Molde FK has enjoyed the co-operation with the press and media. At Aker Stadium we can offer modern facilities and good conditions for your work, and we hope you will enjoy your visit. Map to find the stadium, click here. Car parking on reserved area on the west side, ask the stadium service crew. Entrance for working press and media officers on the south seaside, basement/ground floor. Registration and information in the Press Centre on the ground floor. 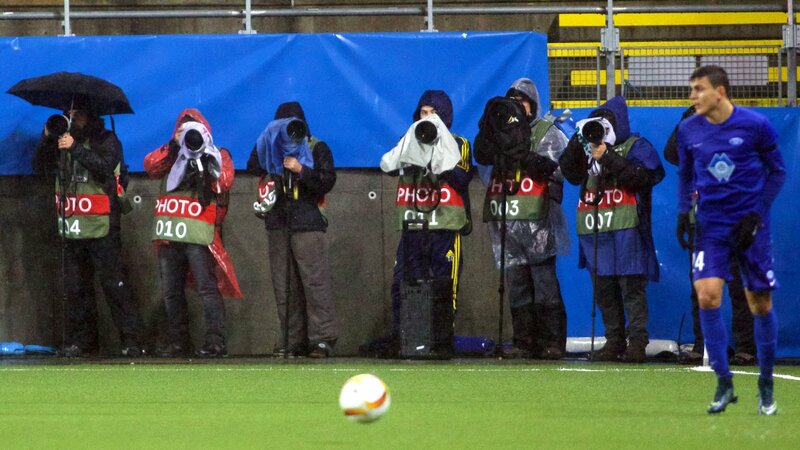 Photographers use their own entrance to the field and do their work behind the advertising boards. No admittance to the players tunnel, and no interviews without special appointment after the players have entered the dressing room. You are requested to contribute to good working conditions by respecting your colleagues. The teams are admitted 5-7 minutes in the changing room before any interview. The teams dressing room will not available for media, requested players will be picked up. In official matches rules from UEFA are to be followed. Special guidelines for pre and post match press conferences; interviews and admittance areas will be informed about when you arrive the press centre before the match. Open 2 hours prior to and after match. On the south side, basement/ground floor, Reception room for registration and information and pre and post match press conferences. Available 2 hours before match. For photographers, camera and sound crew, admittance through special entrance. Outdoors, ab. 35 seats with tables, electric outlet under the tables. Workroom for for the media open 2 hours prior to and after the match. For radio and TV crew, entrance to camera platform, commentator boxes, TV studio, editing room and make-up room / office. On the opposing side of the main stand. For double productions. Sign up for your arrival on beforehand by using our accreditation form . Tell us if you have special requirements like car parking reservation, wish for seats on special areas. Make use of our service crew.